SCVHistory.com JD7902 | Pico Canyon | Photo Gallery: Open House at Mentryville, 12-9-1979. 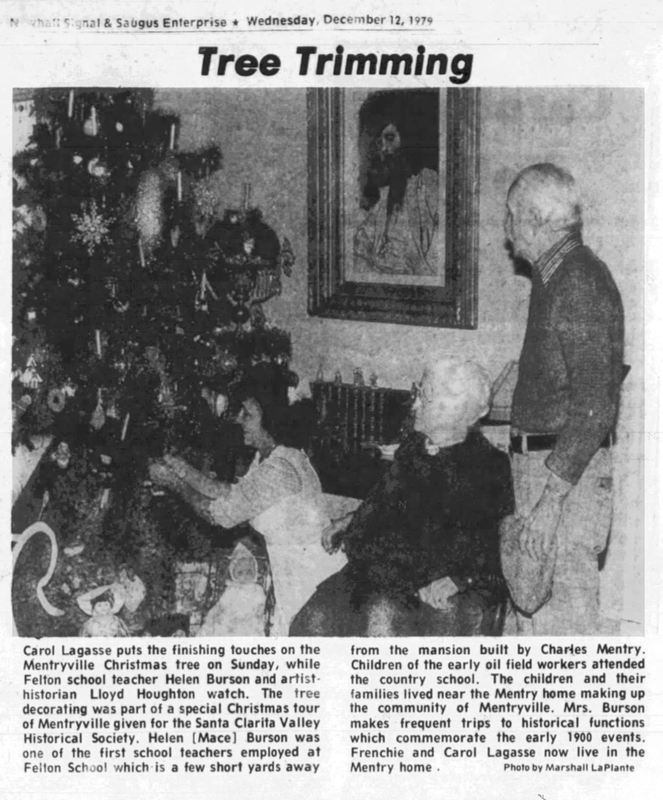 Sunday, December 9, 1979 — Mentryville residents Carol and Frenchy Lagasse open their historic 13-room mansion and the other remaining buildings in the little Pico Canyon oil town for an SCV Historical Society membership drive. Photos from the collection of Jo Anne Darcy, who was the Historical Society's board secretary at the time and volunteered at the event. Photos were probably made by Jo Anne's husband, Curtis Darcy. Jo Anne's descriptions on the back of the prints appear with the images above. Non-members who wished to attend the event could bring $5 to Darcy's business office to cover membership dues. Darcy was executive director of the Newhall-Saugus-Valencia (SCV) Chamber of Commerce. The chamber office building was the Pardee House at 24275 Walnut Street. In 1992, after the chamber moved out of the building, the Historical Society moved the Pardee House down the street to Heritage Junction-Hart Park. The Chamber office site later became Veterans Historical Plaza. A different move was being contemplated in 1979. Two weeks after the Mentryville event, The Signal announced that Southern Pacific Railroad executives had agreed to allow the Historical Society time to move the Saugus Depot from Saugus to Heritage Junction. The move happened the following June. JD7902: Download archival scans here.